This disc from Danny Mulhern, Reflections on a Dead Sea on 1631 Records is an expansion of Mulhern's score for the award winning short film The Dead Sea, written and directed by Stuart Gatt, about the refugee crisis. There are 10 tracks on the disc, recorded in collaboration with members of the London Contemporary Orchestra. Mulhern works mostly with small ensembles, mixing live instruments, synthesis and beats, combining contemporary classical with ambient/electronic, and even if you do not recognise his name you probably have heard his music as he has written scores for TV programmes and films, including Silent Witness and the BBC wildlife documentary The Natural World. The different movements all have highly striking names which create a feeling of narrative, though I have never seen the film - Ganfuja, Captive, Night, Libya, Clandestne, Undercurrents, In the hands of strangers, The Dead Sea, The Child's Name is Hope, Libya (Instrumental). The movements all share the same sense of evocative calm as Mulhern uses ambient and atmospherics combined with carefully placed musical motifs. The result his highly descriptive in a way, and rather more structured than pure ambient music. 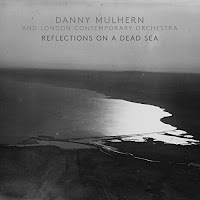 What I liked about a number of the tracks was that the way Mulhearn builds the layers up, placing the musical motifs over the ambient and atmospherics, creating more structural elements yet always within a slow moving, evocative feel. The result is a series of fascinating and perhaps highly disciplined textures which are eerily melancholic. The disc is also availble as a viny LP. Both LP and CD are available from the 1631 Records website. The Dead Sea Trailer from 6th International Films on Vimeo.